I have been developing and shaping this Silver C70 T5 for 5 years or more. Car as of Dec 2011 is now showing 159K plus change. She's 12 years old now. FSH - carried out by HLM Motorsport. Never ever wanted for anything. This was originally a for sale thread - but I am keeping hold of the C70 for now. She is an MY1999 ME7 T5 Sport with an electronic throttle and manual 5 speed gearbox. She is unique in many ways. Very fast - possibly one of the best handling T5s. I have spared no expense on my mods. - IPD Short Ram Intake - Gives great induction noise and release from the recirc valve. - Samco hoses for I/C pipework & hoses in Blue! - Custom Stainless air intake. - Green Hi-Flow rate Volvo injectors - new in August 2009. AFR will never be a problem! - Data logging now enabled for Andriod Phones. - Bilstein B3 shocks. Possibly the best shocks you can buy for this road car? Absolutely no rock or roll, but very progressive and smooth ride. Awesome road holding. - Ferrodo DS2500 - all round. - Dot 5 racing blue brake fluid. - Run on nothing but Shell V-Power. Serviced only with Shell Ultrahelix 5w40 oil every 5000 miles. - NGK Iridium 8 Spark plugs. - Quaiffe LSD fitted into a M56HK gearbox. 1/2 leather, 1/2 alcantera seats & trim. Full Climate Control - Air con still works perfectly. I have fitted an ipod adapter, Alpine make separately - so that you see what you see on your ipod! Volvo OEM 10 cd storage unit fills the gap under the single DIN HU. Vovlo OEM antenna down switch keeps the electric aerial tucked away when not needed. Wheels - I have a set of 5 17" Comet 5 spoke alloys. I did have some nice 19s until some basterd nicked 'em. MY2003 rear clusters fitted in August 2009. MY2003 clear front headlights fitted also 2009. HID 6000 kit with matching LED side light bulbs. Turns night into day. HID 6000 kit for main beam. Osram Nightbreaker bulbs in the fog lights. Clear indicator clusters (see albums below) and clear wing clusters. Electric & heated wing mirrors. Paint work fastidiously maintained using modern paint corrective techniques and the best equipment. Some parts have also been resprayed to correct damage and marks that most would leave alone. There are however marks/stone chips on the front splitter and bonnet edge. I will pass on the Volvo touch-in paint pots I have to help keep on top of them - as I have tried to do. Last edited by Wobbly Dave; Monday 26th December 2011 at 22:44. Reason: PB on 1/4 mile has been surpassed. Cant beilive your selling her dave. You'll be gutted when she goes. I can vouch for the quality in this machine, its lovely. Thanks for the vote of confidence. The new machine will be equally as cool once finished - if not more so. Just uploaded other previously unseen photos, including when I had nothing better to do than make it REALLY shiny! Last edited by Wobbly Dave; Monday 21st December 2009 at 01:18.
that is a great looking car with an awsome spec list. if only i had the pennys !!!! Great looking car at a great and realistic price. Good luck with the sale wobbles and onwards and upwards!!! Forgot to mention the new green injectors fitted earlier this summer. 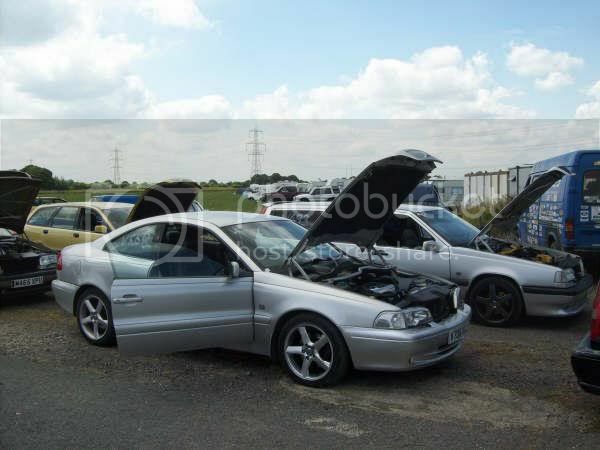 Anyone who buys this car will get a real good un, ive seen it ive driven in it and driven it. Great Car. I am staying in a C70 - except this one is black SE LUX and has a folding roof. So did you buy that one you spyed not long ago? great car and bloody cheap too. Silver beast is staying put. I appreciate all the kind words - I am proud to see that my C70 is held is such high regard. Now for the bad news - I have decided not to buy the black C70 SE LUX and be boring and pay off CC debts etc. Mods - can I have my own Wobbly Dave section in the forum now? Best if you move this thread to C section perhaps? Last edited by Wobbly Dave; Monday 21st December 2009 at 14:34. Best thing to do mate you wont find a better T5 not without spending a fortune and you have done on this one already! You also missed the sale. The price would have been 2795. As that sadly would be a step in wrong direction. It is not the fact I dislike my current ride or anything - I just need to calm it on taking on more commitments. Give me a year - I get my SE LUX.